Today on the 10:00 am trip on the Asteria we headed north to the southern edge of Jeffrey's Ledge. We searched around to the east and then down south along the middle of the bank, but we were not able to find anything. Whales are wild animals, after all, and their behavior is not always predictable. All passengers were issued rain checks due to our lack of whales. 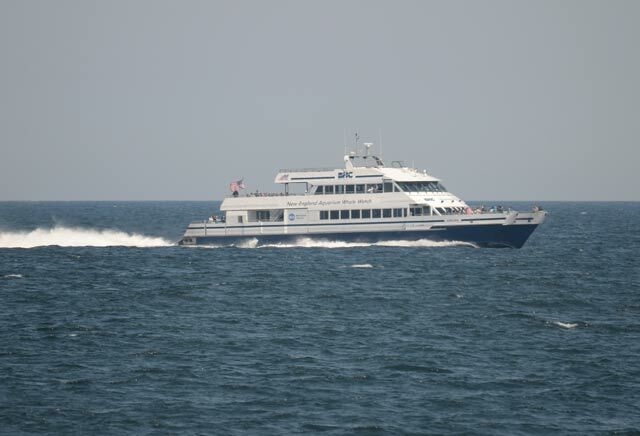 Another beautiful boat from our fleet, the Aurora, heads back to Boston after a successful trip. Today on the 2:00pm trip on the Cetacea we headed back up north to the southern edge of Jeffrey's Ledge and found Satula. He was taking 2 to 4 breaths before diving back down for 5 to 8 minutes. While he was constantly changing directions and sometimes coming up half a mile away from us, we were able to get some up close encounters. All the passengers were thrilled with Satula's performance.